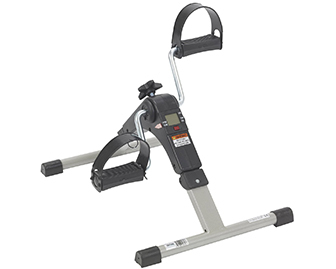 A stationary exercise machine for one’s legs. Place in front of a sturdy chair and utilize it to increase endurance and maintain lower body strength for safe mobility. Commonly found in rehab centers and homes. Pins that offer varying levels of resistance. Pinch the pins and move them from one metal pole to another. Great for rehab / home settings to treat hand weakness and decreased range of motion in the arms or shoulders. 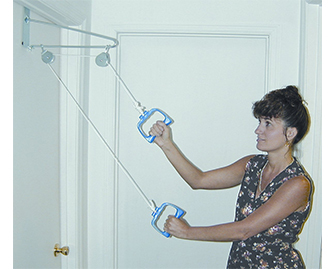 A pulley system that can be attached to a closet door. 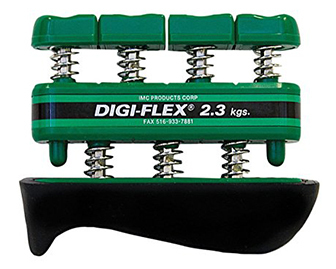 Used for exercises to maintain the strength and range of motion in one’s upper body. Commonly found in rehab centers or homes. Exercises can be done from seated or in standing. 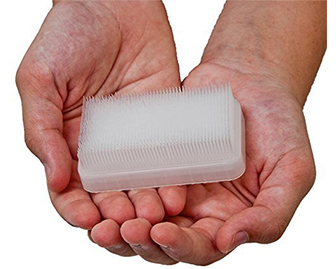 A brush with soft bristles typically used as part of the Wilbarger brushing protocol. Used by therapists or caregivers on adults or children with autism or sensory integration dysfunction to help relieve feelings of distress and provide reassurance. 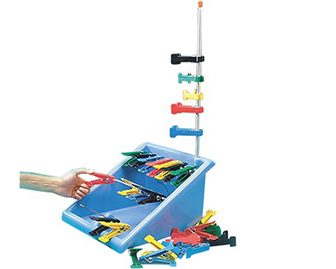 A hand exerciser that offers varying amounts of resistance depending on the purchased model. 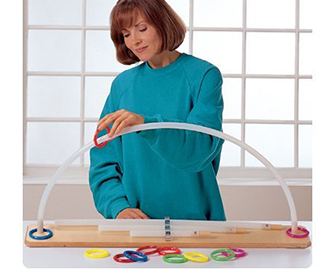 Can be used to strengthen individual fingers or the whole hand. Found in rehab / home settings and used by people affected by stroke or hand weakness.